Archives. 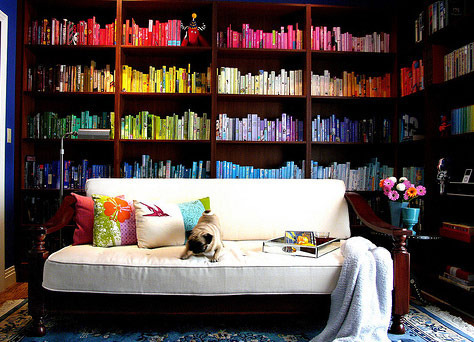 Color + Pug = all kinds of happy. My gf is thinking about getting her son a pug. I was digging through my computer fun files and ran across this image. I saved it for the sheer color coordinating bliss which originally made me think of my bestie Rachel's color coordinated closet. You also have to love those perfect turquoise vases on the side table but noticing there's a pug in it too... well it deserved a post. The image came from the beautiful inter-web somewhere. Probably We Heart It though I truly don't know. Wouldn't you love to get lost in this room for a few hours! I mean seriously the color is so great it's distracting. Dr. Seuss meeting visual magic.